This item is currently out of stock. We are working to renew our supply as soon as we can! Are You Committed to Developing Your Students’ Minds? If so, this book is required reading. Because the quality of your thinking determines the quality of everything you do, critical thinking is fundamental to survival. 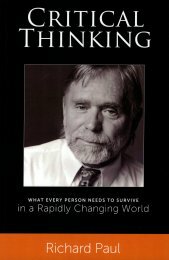 In Critical Thinking: What Every Person Needs To Survive in a Rapidly Changing World, Richard Paul fashions powerful tactics for teaching and learning in every domain, canvassing critical thinking from a broad perspective. He views it sociologically, psychologically, and pedagogically. While clearly seeing its application across domains of knowledge and learning, he also sees the need for working out the details in specific contexts and domains. By bringing his major papers together in one book, the reader is able to grasp the breadth and depth of the role thinking plays in human life and knowledge, and why reform of education grounded in critical thinking is essential to the future of humankind. It enables the reader to see why critical thinking must be cultivated from the earliest years of children’s lives and why the pursuit of critical thinking must be understood as a lifelong commitment.